The LAAP is where Morabs compete against set standards not each other. The LAAP recognizes any activity that your Morab participates in for its entire life. Some of the activities points are earned are: Show, Combined Driving, Endurance/Competitive Trail, Dressage, Team Penning, Trail Riding, Ranch work, In hand work, Horse Fairs and much more. Points are recorded toward the Bronze, Silver, Gold and Miller Hall of Fame achievement levels. There are no time limits for reaching these goals. Breeder Member LAAP Lifetime Nominating two or more horses $10.00 per horse. Upgrade for horses already in the program not Lifetime Nominated $5.00 per horse. If the horse is sold the Nomination will transfer to subsequent owners. For points to count each year the horse owner IMR membership must be current. Activity Fee: $1.00 per form submitted. Category Forms and Fees are due by January 31st for activities of the previous year. The horse owner IMR membership must be current. Horse Nominations may be made at any time. Retroactive points will be recorded for LAAP points. A LAAP Nomination Form is completed for each IMR registered horse at the time of entry into the program. Several horses may be entered on the same form and the horse is then nominated for life. If the horse is sold the LAAP Nomination will transfer to subsequent owners. A Category form is filled out for every area in which a horse participates. Only one horse may be listed per Category Form. There are category forms for Show, Dressage, Endurance/Competitive Trail, Combined Driving, Recreational/Saddle Log and Special Event. 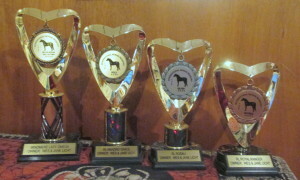 Also, required a copy of the prize list or program or the official published results and signature of the horse owner. Recreational/Saddle logs are filled out for each month separately and signed by the horse owner. Points are based on the activity size, complexity and placement of the horse. Extra points are given for participation in: Special Promotional Events, Regional Horse Fairs, IMBA Futurities, Partner’s n Performance and Morab Specific divisions. Picture and information is listed on the LAAP Award Website. Morabs in the LAAP compete against set standards not against each other. There is no time limit for reaching these goals. These points record all the activities a Morab participates in. A new IMR Registration certificate will be issued with the Achievement level shown on it upon the return of the current certificate. (This is done at no charge.) The special symbols of level are: +BA, ++SA, +++GA, ++++ MHF, ++/GD and ++// SM will become permanent at the end of the Morab’s name. It is an award given to the Morab horse that accumulates the most overall LAAP points for the current year’s activities. These awards are to recognize the competitive miles spent with Morabs. Carriage Driving/ Reinsmanship /Sleigh Rallies/etc. Gaming/ Barrel Racing/Pole Bending/ Keyhole/ etc. Misc. / Costume/Liberty/Most Classic/ Sidesaddle/ etc. A horse may earn Participation points for any event if it is entered and competed but did not place. Also, include any placings in the events above on the Show Category form. Also, include any placings in the classes above on the Show Category form.